Bush Barrow is a site of the early British Bronze Age (c. 2000 BC), at the western end of the Normanton Down Barrows cemetery. It is among the most important sites of the Stonehenge complex, having produced some of the most spectacular grave goods in Britain. It was excavated in 1808 by William Cunnington for Sir Richard Colt Hoare. The finds, including worked gold objects, are displayed at Wiltshire Museum in Devizes. 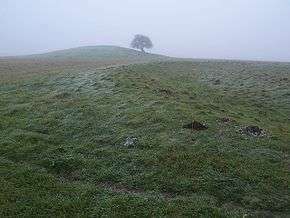 Bush Barrow is situated around 1 kilometre southwest of Stonehenge on Normanton Down. It forms part of the Normanton Down Barrows cemetery. The surviving earthworks have an overall diameter of 49 metres (161 ft) and comprise a large mound with breaks in the slope suggesting three phases of development. The barrow currently stands 3.3 metres high and its summit measures 10.5 metres in diameter. The barrow is one of the "associated sites" in the World Heritage Site covering Stonehenge, Avebury and Associated Sites (Cultural, ID 373, 1986). The Normanton Down round barrow cemetery comprises some 40 barrows strung out along an east-west aligned ridge. Bush Barrow (so named by Cunningham because it had bushes on it) is towards the western end of the line of barrows, sited at the highest point of the ridge. The barrow was excavated in 1808 by William Cunnington for Sir Richard Colt Hoare. It contained a male skeleton with a collection of funerary goods that make it 'the richest and most significant example of a Bronze Age burial monument not only in the Normanton Group or in association with Stonehenge, but arguably in the whole of Britain'. 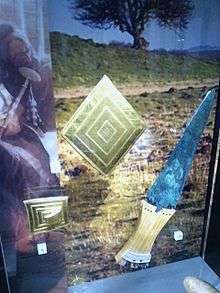 The items date the burial to the early Bronze Age, 1900-1700BC, and include a large 'lozenge'-shaped sheet of gold, a sheet gold belt plate, three bronze daggers, a bronze axe, a stone macehead and bronze rivets, all on display at the Wiltshire Museum, Devizes. 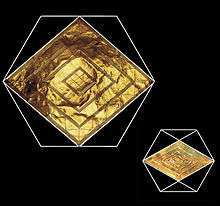 The design of the artifact known as the Bush Barrow Lozenge, and the smaller lozenge, has been shown to be based on a hexagon construction. Both the shape and the decorative panels appear to have been created by repeating hexagons within a series of three concentric circles (each framing the series of smaller decorative panels). The precision and accuracy displayed by the work demonstrates both a sophisticated tool kit and a sound knowledge of geometric form. A similar gold lozenge from Clandon Barrow, in Dorset, used a decagon in its design. Two of the bronze daggers have the largest blades of any from their period, whilst a third had a 30 centimetres (12 in) long wooden hilt originally decorated with up to 140,000 tiny gold studs forming a herringbone pattern. The studs are around 0.2 millimetres (0.0079 in) wide and 1 millimetre (0.039 in) in length with over a thousand studs embedded in each square centimetre. David Dawson, Director of Wiltshire Heritage Museum has stated that: "The gold studs are remarkable evidence of the skill and craftsmanship of Bronze Age goldsmiths - quite rightly described as 'the work of the gods'" Optician Ronald Rabbetts has said that "Only children and teenagers, and those adults who had become myopic naturally or due to the nature of their work as children, would have been able to create and manufacture such tiny objects." It is thought that the gold came from Ireland, and the dagger was made in Brittany. The hilt lay forgotten for over 40 years from the 1960s, having been sent to Professor Atkinson at Cardiff University, and found by one of his successors in 2005. An unusual stone mace head, shaped into a made out of a rare flecked fossilized corel stone, originating in Devon. It had a wooden handle,from which bone zig-zag decorations survive, reminiscent of items from Greece and Spain. Some fragments of bronze rivets and other scraps of bronze have been identified as the remains of a knife that would have been at least 200 years older than the rest of the items. This dates the knife to being contemporary with the construction of the Stonehenge trilithons, and suggests a treasured antique or heirloom, buried along with the rich new items of the occupant of the barrow. It is not known why this barrow contained such rich grave goods compared to those around it. It occupies the highest point, but is not the tallest barrow, and is not obviously marked out as the principal barrow in the cemetery. In particular it is not known if other barrows in the vicinity have simply had such goods plundered long ago. Numerous finds have been made in other barrows, both by Cunnington and subsequently, but nothing to compare to these. According to Barrett and Bowden, "absence of evidence does not necessarily imply evidence of absence". 1 2 3 4 Historic England. "Bush Barrow (943060)". PastScape. Retrieved 17 August 2014. 1 2 3 Barrett, Kate; Bowden, Mark (2010). Stonehenge World Heritage Site - Landscape Project: Normanton Down: Archaeological Survey Report (PDF). Research Department Report Series. 90-2010. English Heritage. pp. 11, 32. Retrieved 26 January 2015. 1 2 David Keys (17 September 2014). "Stonehenge's most intricate archaeological finds were 'probably made by children'". The Independent. ↑ Melrose, Robin (2010). The Druids and King Arthur: A New View of Early Britain. p. 96. ISBN 9780786460052. 1 2 Khan, Urmee (22 Oct 2008). "Britain's 'most important archeological' discovery found in desk drawer". Daily Telegraph. 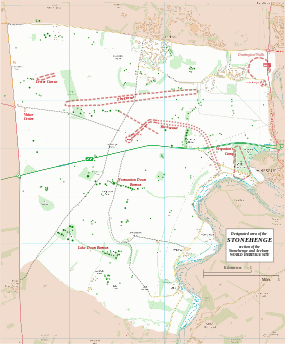 Wikimedia Commons has media related to Bush Barrow.